Opening Day for the IRS is Today January 28, 2019. That’s when the Internal Revenue Service will start accepting electronically filed tax returns. We have until April 15 to file tax returns but many file earlier in the season, if they’re expecting large refunds. What do tax filers need to know this season? 1. Get an appointment if you want to talk to someone at IRS offices. Don’t expect to drop into an IRS office to get any help this tax season. All offices are appointment-only now. If you need to visit an IRS Taxpayer Assistance Center in person, you must schedule a time by calling 844-545-5630 for the appointment hotline. Taxpayers are asked to check IRS.gov for the days and hours of service, as well as the services offered at the location they plan to visit. 2. Beware of a new hurdle if you’ve used a special Individual Taxpayer Identification Number. Some tax filers will be unable to file their federal tax returns if they do not update Individual Taxpayer Identification Numbers. Warning: Any ITIN that has not been used in the past three years will no longer work for filing that return. On top of that, individual tax identification numbers that have middle digits of 73, 74, 75, 76, 77, 81, or 82 also expired at the end of 2018. Tax filers in these situations must renew an Individual Taxpayer Identification Number as early as possible because they cannot file a tax return without one. A super-sized headache? The IRS notes that it can take up to 11 weeks during the peak of the tax season to get that number from the time you send in a renewal application, known as Form W-7, for the IRS to process the application and notify you about your status. Why the change? A new federal law to combat fraud included the requirement that certain Individual Taxpayer Identification Numbers expired on December 31. “Anyone filing a tax return with an expired ITIN could experience return processing and refund delay as well as denial of some tax benefits until the ITIN is renewed,” the IRS said online in a statement. These identification numbers often are used by people who have tax-filing or payment obligations under U.S. law but are not eligible for a Social Security number. 3. Some struggling families will face delays for their tax refunds. The IRS notes that more than nine out of 10 refunds will be issued within less than 21 days, which is good news. But tax filers who benefit from the Earned Income Tax Credit and the Additional Child Tax Credit should not expect their refunds until possibly the week of Feb. 27, even if they file as soon as January 10th. The reason? Congress is cracking down on tax-return-related fraud. The Protecting Americans from Tax Hikes Act mandated the IRS delay issuing tax refunds for returns claiming the EITC or the Additional Child Tax Credit until Feb. 15. The move is designed to give the IRS more time to detect fraud and prevent refunds from being issued to ID thieves who file fake tax returns using such credits. But consumers who depend on the refund cash will face extra delays, given holidays and weekends. Another thing to note: The IRS online “Where’s My Refund” tool will not show an estimated date for many tax returns involving the special credits until after Feb. 15. “So don’t panic in late January and mid-February if you don’t see a refund date on ‘Where’s My Refund.’ That’s just how the tool will operate given the special circumstances with the EITC and ACTC refunds”. “Where’s My Refund” at www.irs.gov and the IRS2Go phone app will be updated after Feb. 15 with projected deposit dates for the early filers who receive the earned income credit and additional child credit. 4. Look out for high-cost, quick-cash on tax refund advances. Tax filers might be tempted by refund anticipation loans that proclaim “no fee” will be charged. But Chi Chi Wu, staff attorney for the National Consumer Law Center, warns that in some cases, borrowers could face other higher fees for tax preparation or another product. Advance loans are being heavily marketed this year by some firms, including H&R Block and Jackson Hewitt, in light of the new delays ahead for tax refunds for those who file those Earned Income Tax Credit and the Additional Child Tax Credit. Jackson Hewitt is marketing for its Express Refund Advance, a loan of up to $1,300 that has no fees, a 0% annual percentage rate, and no credit check. To get the loan, you will have to pay to file your taxes with Jackson Hewitt. H&R Block began offering a tax-related loan for a limited time beginning Jan. 6. The H&R Block Refund Advance offers loans in the amounts of $500, $750, or $1,250 upfront for 0% interest. The loan is loaded onto an H&R Block Emerald Prepaid MasterCard. The amount of the advance will be deducted from tax refunds and reduce the amount that is paid directly to the taxpayer. Both Jackson Hewitt and H&R Block only offer the loans to customers who visit their offices and outlets; it’s not available online. 5. Take a close look at that W-2 Form. About 70 million W-2 forms will include a 16-digit verification code that tax filers or preparers will need to add when prompted by tax software. About 60 million W-2s had such a code during the 2018 filing season. The IRS anticipates that the verification code ultimately will be used on all W-2 forms in future years. Again, we’re looking at another hurdle to try to corral the crooks and prevent the filing of fake tax returns. 6. Remember, scam artists love tax season. “We continue to ask the public to be vigilant because the scamming doesn’t stop,” said Luis D. Garcia, IRS spokesperson in Detroit. The con artists pretending to be from the IRS might reach out via your e-mail inbox, your mailbox or even knock on your front door, Garcia said. And the crooks are going after tax preparers, too. Earlier in January, the IRS warned that cybercriminals were pretending to be tax filers who wanted help filing their returns. If the tax preparer responds, a second e-mail is sent that has either an embedded web address or contains a PDF attachment that has an embedded web address. “The tax professional may think they are downloading a potential client’s tax information or accessing a site with the potential client’s tax information,” the IRS warned. Oddly enough, I even got one of these phishing e-mails last week. The language was stilted and off-kilter, which can be a warning sign. It began “Hello, CPA,” which I am not. “I need a careful and experienced high-quality accountant, to handle all matters of accounting including tax preparation, IRS problem resolution, and matters expected of a CPAs to handle for Individual and Small Business,” the e-mail read. Love that last line. I’d love to respond: Find this attachment for a way to learn how to diagram sentences and master subject-verb agreements. But then again, we don’t want the scammers to get even better at this game, do we? Best to kill and ignore all such phishing e-mails. Are you expecting a tax refund this year? The majority of filers should, according to past IRS statistics. Out of the nearly 140.9 million returns processed last year, almost 101 million resulted in refunds. Total refunds for the tax year 2018 were just over $282 billion, with an average refund of $2,600. That’s great news in many respects — until you realize that you have effectively loaned your refund amount to the government interest-free. As much fun as it can be to get a refund, it’s more efficient and economical to balance out your withholdings as precisely as possible so you owe nothing or very little in taxes. Why not make the interest on the extra withholding yourself? Assuming you do get a refund, you can track its progress using the IRS tool “Where’s My Refund?” With your Social Security Number or Individual Tax Identification Number (ITIN), filing status, and exact refund amount expected, you can check your refund status within 24 hours after an e-return has been received or 4 weeks after mailing a traditional paper return. You may also check your refund status on a mobile device using the IRS2Go app. Just don’t forget to claim it, as many of your fellow taxpayers never put in for the refunds they have earned. 9. How much money does the government receive in taxes? How much money does the government receive in taxes? Government revenues rose from just under $3.25 trillion in the 2015 fiscal year to $3.267 trillion in the 2016 fiscal year. Individual income taxes comprised just under $1.55 trillion of that total. Unfortunately, with corresponding outlays of $3.854 trillion, we are left with a $587 billion deficit for fiscal 2016. Cutting this deficit seems unlikely in 2017 for several reasons. First, it hasn’t been done since 2001, regardless of which party has controlled the White House or Congress. Next, the incoming President has promised to cut taxes massively while rebuilding the nation’s infrastructure. Finally, he has indicated an unwillingness to trim Social Security benefits. Put it all together and we have a recipe for continuing — and quite possibly expanding — deficit spending. Are you a tax procrastinator who cares more about the end of tax season than the beginning? The filing deadline in 2019 is Monday, April 15. The IRS suggests filing your taxes as early as possible once you have all the required documents. Once a criminal gets access to your Social Security number, he or she has everything necessary to file a tax return in your name. The purpose of a fraudulent tax return is, obviously, not to pay your back taxes, but to pocket your tax refund. This scam occurs early in the tax season, well before most taxpayers file. Take every possible precaution to keep your SSN secret. In the previous filing season, the IRS processed almost 140.9 million returns. According to the IRS Commissioner, the agency expects to process over 150 million tax returns in the upcoming tax year as well. If you’re expecting a refund, it doesn’t pay to procrastinate and risk being caught in the middle of millions of last-minute returns. 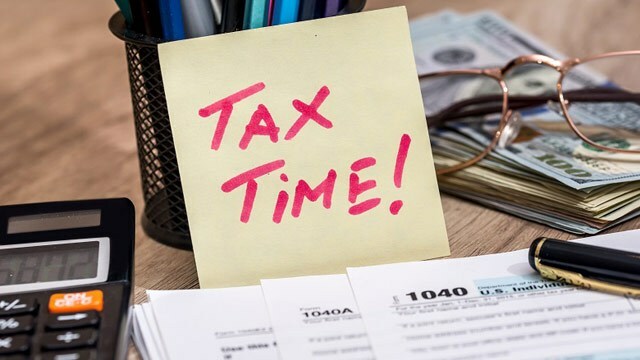 However, if you have to pay taxes, there’s no harm in waiting to file closer to the deadline — just don’t wait until the very last minute in case either you or the IRS run into last-minute technical problems. Taxpayers can usually get an extension on their return, but they must still pay taxes owed by the deadline or incur interest and penalties. Sure, you can wait until mid-April and then frantically take your shoebox full of crumpled receipts into your local tax preparer, begging for help — but why would you wait? Pre-season planning can help you and your tax preparer thoroughly investigate all the deductions and credits available to you to help you get the most out of your refund. In fact, there are things you could do today to save on this year’s taxes. File nearer the deadline if you want, but have your taxes prepared early in any case. Find some time amid the hectic holiday to take a few simple steps and make your life easier as tax filing season kicks in. Even better, get in the habit of organizing your tax materials throughout the year in order to make the next season go as smoothly as possible. Nobody enjoys going through the dreaded crumpled receipt shoebox, whether the filing deadline is a few months or a few hours away.